According to reports in Spain, one of Valencia’s biggest prospects is on his way to Manchester to sign a deal with Manchester City. 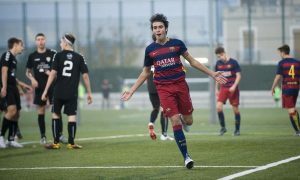 Super Deporte report that young Valencia striker Nabil Touaizi (15) is set to sign for Pep Guardiola’s men today in a deal worth an initial €350,000. Txiki Berigistain has worked quickly on the deal as other major clubs had the youngster on their radar due to rapid growth in his abilities. Manchester City could have taken the player on a free transfer but would have had to pay compensation to Valencia, however the club struck an agreement in order to avoid any further complications. The agreement is a fee of €350,000 and a further €2 million once the youngster debuts within the first-team. Nabil Touaizi is labelled the ‘diamond of the Valencian quarry’ and has huge potential. He’s the latest addition to Manchester City’s ever growing youth academy which aims to feed the first-team players for years to come.